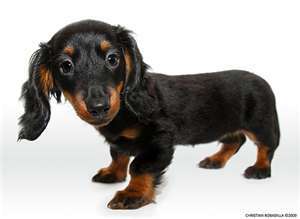 In my series of articles about the letters of the alphabet, we now come to the letter D. There were quite a few things that I could have written about, such as dirt, dragons, desserts, or dishwashers, but I kept coming back to my favorite dog, the dachshund. 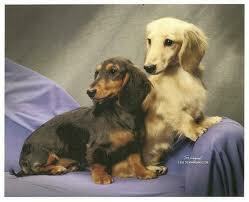 My family first owned a dachshund when we lived in Bremerhaven, Germany, and her name was Elia. She was a red standard, smooth coat, and although I was only nine or ten at the time, I agreed with my parents that she was quite stubborn--a common doxie trait. In an attempt to housebreak her, my parents left newspapers down for her to use: that seemed to be the method of housebreaking dogs back then. After all, we lived in a third-floor apartment with no elevator, so it wasn't always convenient to take Elia out when necessary. There were sixty-four steps up to our apartment--I know, because I often counted them when I came home from school in the afternoons. A lot of stairs. Well, Elia would "hold it" for hours and hours when my mother would put her out on the balcony in the attempt to get her to do "her business." Then, when Mom took pity on the poor dog and let her in, that's when Elia decided it was time to go potty--right there in the middle of the living room floor. Mother was not happy, to say the least. I don't recall what happened to this stubborn-but-loving doxie. We left Germany for the States when I was twelve, so another family inherited Elia. I believe that she was housebroken by then, though. Dad reprimanded the poor dog so often that she perfected the action of turning her head away at the exact second that my dad looked in her direction to see if she was watching him. That's right. She'd turn her head in another direction immediately if Dad so much as glanced at her! 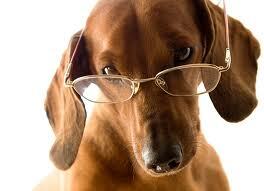 So don't tell me that dachshunds aren't intelligent! My dad absolutely loved dogs, though, and they loved him. Another feat that confounded our family and friends was when Dad taught Sam to say a few words, and they were actually intelligible. Being a Southerner, Dad never said "hungry," but pronounced it "hongry." Well, Dad taught good ol' Sam to say "hongry" just like he did, and it was hilarious. Dad would say, "Sam, what do you want, girl?" Sam would reply, "Hongry!" Sam also learned to say she wanted to go out. I remember watching Dad as he taught Sam to "talk." He'd say, "C'mon, Sam, say 'I wanna go out.'" Sam would growl out some unintelligible syllables, punctuated with a wagging tail. She was trying to please him because she adored him so. Dad would shake his head no, and say, "Sam, say you wanna 'GO OUT." Finally, and I don't remember how long it took her to learn it, but one day Sam managed to croak out "Wanna go out." I nearly passed out with surprise, because she clearly enunciated those words. People loved hearing Sam "talk," and so did we. Sam eventually had a litter of cute little puppies. My brother Steve would just lie down in the grass that summer, letting all those little dawgs crawl all over him--they licked his face, bit his nose and ears, pulled his hair, but he loved it. Only another committed dog lover would understand that! Sadly, Sam managed to get out of Mom and Dad's fenced-in yard years later after Steve and I were grown. Our parents lived in a subdivision only a quarter mile from U.S. Highway #1, an extremely busy interstate, and Sam made her way to that highway and was hit by a car. My dad got to her too late to prevent it, but he found her in a ditch and scooped her up, taking her immediately to the vet. He later told us he was crying as he gently placed her in the back seat, telling her how sorry he was that he had "let" her get out. 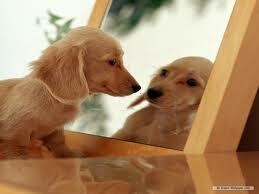 She wagged her tail weakly and licked his face. Sam didn't make it--the vet told Dad that her insides were all torn up. This story brings tears to my eyes even now as I recall it, decades later. Sam was a wonderful, gentle, and loving dachshund, and all of us loved her. I never had another dachshund in my life until our daughter and son-in-law came to our house one evening 14 years ago, and in her arms, Holly was carrying the cutest little black-and-tan smooth doxie puppy you ever saw! This little eight-week-old puppy was "the now-famous" Shadow, upon whom I've based Sarge of THE DACHSHUND ESCAPADES. I've never seen a dog who loved to chase a ball as much as Shadow did as a puppy. Clark has often said that he nearly dislocated his shoulder at times when we babysat that doxie at our house, because Shadow just wouldn't quit for hours on end. He was the elder statesman in the family of our animals of six cats (each married daughter has three) and two dogs (Duke is the other doxie), until he crossed the Rainbow Bridge on 02/01/17. Two of the cats, Tate and Joey, are the "Fuzz Brothers" from I AM SARGE. Piper and Aslan are also included in the other books, along with relative newcomers, Winston and Thor. And now to our own doxie, Duke. who sadly crossed the rainbow bridge on July 28, 2017. I've written about him often and in numerous places, so I won't spend much time here. Just suffice it to say that he fulfilled my desire to have a dog with personality--and he did it in spades. He was a what-a-dawg who was just enthusiastic about life in general and loved to play--but don't laugh at him or make fun of him: he'd "tell you off" on the spot. He was known to talk back and argue, too, on occasion. But he was so loving, a chow hound, a clown, and a nose with legs, all rolled up into our glorious family pet. So what if I spoiled him? He was worth it, you know :). And now, we have a new granddawg, Sunny. She's every bit a dachshund, and then some! She already knows how to wrap every human she meets around her little paw and rules the roost at home with five humans, three cats, and her boxer brother Bruno. We were all worried that Bruno might get carried away in playing and accidentally hurt her. HA! She more than holds her own, and he has infinite patience and kindness toward her. He's so big and strong, and she's so little and cute, but DON'T LET HER FOOL YOU. She knows who she is, and I suspect that she truly thinks she's a princess! 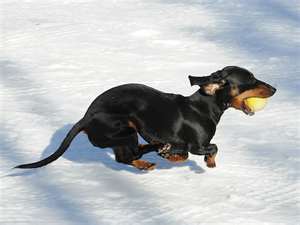 To our beloved, "I'm-as-big-as-any-other-dawg" dachshunds: you make life so interesting and fun. I can't imagine missing out on your cold nose, your loud bark, your insistence that we play with you, and your crocodile-like yawns. You rule! Granddawg Shadow (RIP) with Thor, his kitty brother--they were good buddies!